The spending of Obama and Congress now resembles the obese restaurant patron that devours everything at the all you can eat buffet but leaves the parsley. After gorging themselves, they try to fool you into thinking they didn't overdo it and actually exercised some restraint. After spending 2 trillion, they plan to leave the parsley and think we will be swayed by it. Today is the day that Obama left the parsley, namely he has ordered bonuses to be frozen for political appointees and requested Congress to freeze appointees' salaries as well. "President Barack Obama on Tuesday ordered bonuses be frozen for political appointees in the federal government, as the White House sought to show it was being careful with taxpayer dollars before the Nov. 2 congressional elections." "Polls show public support for Obama has slipped because of deep concern about the economy and high unemployment. His Democratic Party faces heavy losses in the elections and Republicans blame him for spending that they say will push the U.S. budget deficit to a record $1.47 trillion this year." So now Obama wants to be careful? This is all about self-interest and self-preservation. This is nothing more than a political ploy to make it appear as if Obama is being fiscally responsible. It is an insult to the intelligence of all Americans if he thinks we the people will fall for his ruse. Truthfully, after Obama has thrusted his economic gluttony of spending upon the nation and rewarded the sloths with redistributing the wealth, the nation is now stuck with a bloated deficit of almost 2 trillion. If we look at this chart, one can observe that Bush left office with a deficit of less than 500 billion. Obama has managed to more than triple the deficit in just 18 months of being in office. Yet, Obama constantly spews lies and deceit on his blame Bush campaign, despite the truth of the facts and evidence being to the contrary. 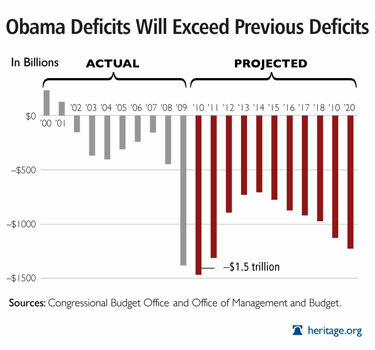 Obama is responsible for the enormous deficit now, and will remain responsible for it for at least the next decade. Although Congress is responsible for the budget, the blame for the deficit could really be shared equally between the leftists and Obama, since they share the same agenda. This is important to remember, because keeping any of them will cause further damage to the economy. Collectively, they must be viewed as a group. And now that they know their re-election hangs on a thread, we get one little act of feigned responsibility to portray as if they are going to curtail spending. What a joke. The only ones they are fooling are themselves. America watched these ravenous porkers with insatiable appetites for spending wash America down the drain and clog our economy with exorbitant deficits. If we are ever going to have an economic recovery, we need to purge ourselves of the gluttons as soon as possible, and November is the perfect time for us to break out the Drano.